The Armenians had trading relations with India from ancient time, and known as the “Merchant Princes of India”. Initially they settled in Emperor Akbar’s court. Some came to Serampore and Calcutta to settle there, supposedly under the invitation of Job Charnock. The recently deciphered inscription on Rezabeebeh’s tomb in the Church of Nazareth, upsets the accepted chronicle of British settlement in Calcutta. The text reveals that Rezabeebeh, wife of the late ‘Charitable Sookias’ had lived in Calcutta until she died on July 11, 1630 – about 60 years before Charnock settled. The Armenians were among the first trading communities of Calcutta. The city still bears the footprints of the vibrant community thrived in her soil. There exists a locality in Barabazaar named Armanitola where the Armenians stayed initially, and nearby a street that bears the name Armenian Street. The Armenians had also populated an area close to Free School Street, called Armani-para, or the neighbourhood of Armenians. Armenians concentrated first in North Calcutta areas, and when the area became crowded, they moved to the Central Calcutta and thereafter toward South Calcutta where they owned almost whole of Queen’s Park and Sunny Park. With time, the social structure of the Armenian community changed. A purely mercantile community at the beginning, they took opportunities for diversifying their enterprises and became owners of merchant ships, collieries, real estates, racehorses, jewelries, and the kind of business. Their successful ventures in money making and their philanthropic contributions made them important members of the Calcutta society. The lifestyle of the Calcutta Armenians of later generations changed enough to accept new professions to become noted scholars, doctors, lawyers, architects. In their construction business, Armenians set a high standard for private and public buildings. They built hundreds of residential houses, public buildings, mansions and palaces all over Calcutta. It was the Armenian architects who took leading part in converting Calcutta into a ‘city of palaces’, where they built every other landmark buildings, like Park Mansion, Queen’s Mansion, Harrington Mansion, Nizam Palace, Grand Hotel, and many others. Armenians also built unique churches, educational institutions, ferry ghats and bathing ghats and excavated tanks as well. The Armenian Church of the Holy Nazareth, an Armenian Apostolic church is located in the northwest corner of Barabazar, and is called “Mother Church of the Indian Armenians”. It is possibly the oldest church in the Calcutta built in 1724 on the burial ground of the community by Agha Nazar after a fire destroyed the previous Armenian church that had been built on the land in 1688. The Holy Nazareth structure is one of three Armenian churches in Calcutta; the other two are Saint Mary’s Church and the church of Saint Gregory the Illuminator. The most significant gift of the Armenians to the city was the Armani-ghat, or, Armenian Ghat that stood on the river bank till recently with its beautiful structure, reminding their socio-economic relationship with the city life. The Ghat was constructed in 1734, on river edge adjacent to the old Howrah Bridge, by Manvel Hazarmall, better known locally as Huzoorimal, to facilitate shipment of goods from foreign shores. This was where the Eastern Railways, during 1854 – 1874, had their ‘Calcutta Station and Ticket Reservation Room’ for the passengers to buy train tickets and cross the Ganges on Railway owned steamers/ launches to board their train from platform at Howrah. Manvel Hazarmall also gave away several bighas of land at Kalighat where he constructed a pucka ghat near the temple, and excavated a large tank at Boitakkhana which went by his name till filled up. A street, Huzurimal Lane, named after him still exists in Nebutala area. Personal details of Manvel Hazarmall are little known, besides that Aga Hazarmall Satoor was his father’s name, and that Manvel was wealthy and influential nobleman friend and subsequently executor of Omichand, the wealthiest native resident of the town in his day. The other fact we came to know was that the beautiful belfry serving as a clock-tower of the Nazareth Church, was built in 1734 by Mavel Hazarmall, following the wish of his father, Aga Hazarmall Satoor died the same year and buried there. Among those Armenian families settled in Calcutta immediate after Hazarmalls, the most reputable was the Apcars, originally from New Julfa. Aratoon Apcar was the first Apcar settled in India, He landed to Bombay as a boy of sixteen, founded there Apcar & Co. and in1830 moved to Calcutta where he made his fortune. Arratoon’s second son, Seth Apcar was the first Armenian Sheriff of Kolkata. The youngest son, Alexander Apcar was the Consul for Siam. Alexander’s son, Apcar Alexander Apcar, a keen cricketer, was president of the Calcutta Turf Club, and the Bengal Chamber of Commerce. Arratoon Apcar’s younger brother, Gregory Apcar was noted for his charitable work, particularly to the Armenian Apostolic Church and the Armenian College, which was founded by another noble Armenian, Asvatoor Mooradkhan in 1821. The painting featured at the top is a portrait of the ship, ‘S.S. Catherine Apcar’ – an oil on canvas by a late 19th Century School of oil painter, apparently unsigned. c1893. 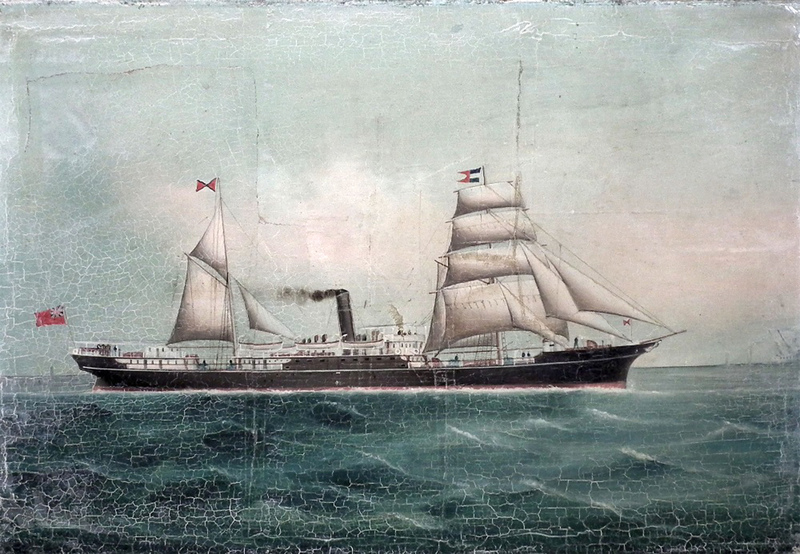 It was a passenger vessel, built in 1892 by D & W Henderson Ltd Glasgow for Apcar Brothers Calcutta, who was the owner until 1912 when BI Company bought it. The vessel was scrapped in 1929.